For the first time ever, EPA-registered disease control, advanced nutrition and proven plant health improvement are available in one systemically active product – Bullet® HLB®. Bullet® HLB® combines our legacy products’ proven disease control and advanced plant nutrition through our innovative GroRXTM technology. This new formulation works systemically inside the phloem, works with no additional additives, and works effectively at only 3-4 applications. Bullet® HLB® is the next generation of citrus protection and production. Download the Bullet HLB label. 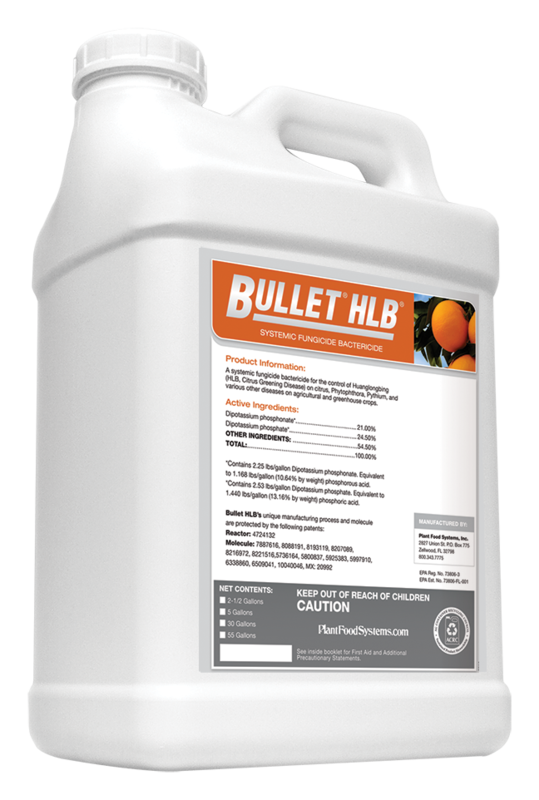 Bullet HLB - A one-shot solution for control of HLB citrus greening, brown rot, canker & improved tree health. The news is out. Check out the coverage of the newly developed Bullet® HLB®, the "one shot" product for growers combating HLB Citrus Greening. We are committed to helping growers fight this disease, improve grove health and increase their annual production with Bullet® HLB®.